These wonderfully tasty and tender chicken breasts are flavoured with orange and harissa (a traditional Moroccan spice paste made with chillies and cumin). Prepare the chicken by carefully lifting the skin away from the flesh at one end of each breast and sliding your fingers in to separate the skin from the meat. Do not remove the skin completely. In addition, carefully cut pockets into the sides of the breasts, without cutting all the way through. Quarter the whole oranges, remove any pips and roughly chop. Place the orange pieces (skin and flesh) together with the remaining ingredients in a food processor and pulse to make a rough paste. Push half the orange mixture between the chicken skin and the meat and the remaining half into the cut pockets of each breast. 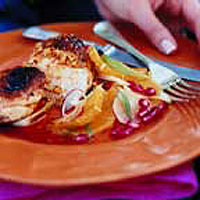 Place the chicken in a shallow dish, cover and keep in the fridge until needed. Prepare the barbecue or preheat the grill to medium. Cook the chicken skin-side down on the barbecue (or skin-side up under the grill) for 10 minutes. Turn over and cook on the other side for a further 10 minutes, or until thoroughly cooked, the juices run clear and there is no pink meat. Serve immediately. This amount of harissa gives a mild, sweet taste. For more spice, add extra harissa to the butter mixture.